The Web Goddess, who truly is a Renaissance Woman, is fascinated by neurology. She hungrily devours any book or article for general audiences about how the brain and central nervous system work. If you share that interest at all, I highly recommend the story she flagged for me this morning, which was in yesterday’s New York Times Science section. I find the story gripping for an entirely different reason, about which more to come. 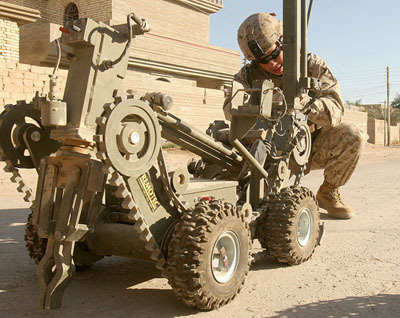 It turns out that when it comes to Improvised Explosive Devices (IEDs), fancy American technology is great, but there’s no substitute for the instincts of (certain) American soldiers. [H]igh-tech gear, while helping to reduce casualties, remains a mere supplement to the most sensitive detection system of all — the human brain. Troops on the ground, using only their senses and experience, are responsible for foiling many I.E.D. attacks, and, like Sergeant Tierney, they often cite a gut feeling or a hunch as their first clue. “Sergeant Tierney” refers to a soldier who saved the life of a comrade one summer morning by sensing that something was wrong on a nearly deserted street in Mosul. The article opens with a scene-setter about a soldier under Tierney’s command who sought permission to give some water to two Iraqi kids in a closed car on a 120-degree day. The 2,100-word article makes you wait to the very end to learn what happened, but you can guess the outcome. Sergeant Tierney denied permission for the humanitarian gesture — and when the soldier turned around to fall back, the car was exploded remotely. The unidentified soldier suffered only minor injuries — but the two young Iraqi boys, of course, suffered the fate their elders intended. Sort of puts waterboarding a known mass murderer into perspective, doesn’t it? My point here (and I don’t necessarily speak for the Web Goddess) is not to advocate waterboarding, a practice I oppose. To paraphrase a recent American president, my point is that good and evil both exist in the world — and the God of my understanding is not neutral between them. That’s right: I believe God is on our side, in a war against an enemy that has perverted a major global religion. Some will argue that a belief in God’s blessing is exactly the kind of self-justifying mindset that leads to excesses like waterboarding. I think the opposite is true. Our society has a passionate yearning for God’s approval (or for my secular friends, a yearning to be Good). That yearning leads us to wrenching but necessary national debates about the precise point where interrogation goes too far — while our enemies deliberately murder two young co-religionists in an effort to take advantage of our humanitarian instinct. This entry was posted in Uncategorized and tagged America, Evil, Iraq, Islamic Fascism, Web Goddess by Kirk Petersen. Bookmark the permalink. Very interesting. But why should we be against waterborading? I read a while ago about how this technique, waterboarding, saved American lives via the information we got from using it? I mean, certainley we are still being much more humane than our enemy whom uses beheadings, does not wear a uniform, is global in nature, and hides behind woman and children in battle, etc..
marie, you raise a serious point about life-saving information that may have been gained through waterboarding. But in the long run, I think we will be safer if enemy forces believe they will be treated humanely. Also, if you read the report of the Senate Armed Services Committee at http://media.washingtonpost.com/wp-srv/nation/pdf… you'll get a sense of how a willingness to loosen the standards of humanitarian treatment rippled through the government bureaucracy and led to inappropriate conduct, including the abuses at Abu Ghraib. It's hard to have any sympathy for Khalid Sheikh Mohammed being waterboarded, but it's clear the practice extended well beyond him. I had not heard of Dave Gaubatz, the subject of the Melanie Phillips article you linked to, and I don't have any opinion about him. I found he has a blog at http://dgaubatz.blogspot.com/. OMG that is hideous and should serve as a poignant reminder of the enemy we face. They are EVIL. Christians were more like Muslims before the Reformation. meg, thanks for stopping by. Yeah I don't know Kirk, I mean first I have to ask myself "who and why" are these people in Abu Ghraib? I mean, how many are really innocent, if any. Not 'knowing' that much (maybe I am using my gut instinct here?) I also have to ask what were these 'abuses'.. I've heard they get pretty good treatment in there, all things considered. Don't forget that in almost any place we can find some rotten apples, but did the few rotten apples that "tortured?" a few inmates really represent that the whole thing should be shut down after 'all things are considered? '– I'm just not so sure and my gut tells me different. And like you said how the loosening of standards led to some people abusing, I think they should weed out the bad apples instead. I think you're mixing up Abu Ghraib and Gitmo. Guantanamo is where the stories have been about detainees gaining weight on the halal meals, etc. The Abu Ghraib photos were a disgrace regardless of whatever those detainees had "done". you are right I did mix it up, but I still say the bad apples should have been weeded out instead. I mean our military they didn't have these prisons going for the fun of it, right? Why do we let the bad apples spoli the whole apple cart, you know.. it just doesn't make sense to me.